After much rehearsal footage of Atoms For Peace has gone online, it was announced yesterday that the band were to play a secret show in Los Angeles this Friday, June 14th. It is now known that the performance is at an undisclosed location called Club Amok. Tickets for this exclusive show will not be available for purchase, however, Silverlake Conservatory will be holding a raffle, and tickets will be given away by LA radio stations KROQ, 98.7, and KCRW. Any other remaining tickets for this event will be available at certain independent music stores in the Los Angeles area. For those of you who are unaware, Atoms For Peace's all-star ensemble includes Radiohead frontman Thom Yorke, along with Radiohead's producer Nigel Godrich, Beck and R.E.M. drummer Joey Waronker, Mauro Refosco of Forro In The Dark, and the Red Hot Chili Pepper's legendary bass-guitarist, Flea. 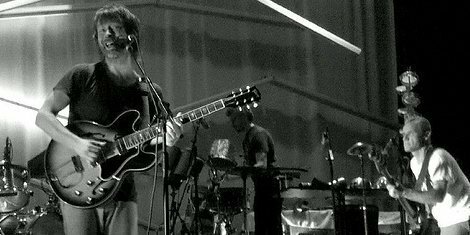 Material from the group's debut, Amok, is expected to be performed, as well as some material from The Eraser - Yorke's 2006 solo album. The band's performance will then be followed by a DJ set from world-renowned, Californian DJ, the Gaslamp Killer. People in the Los Angeles area can view further information for tonight's mystery show on Atoms For Peace's official website. Atoms For Peace will also begin their world tour in Paris, July 6th. Tickets can purchased on Atoms For Peace's website. INTERESTED IN GETTING TICKETS? HERE'S HOW! 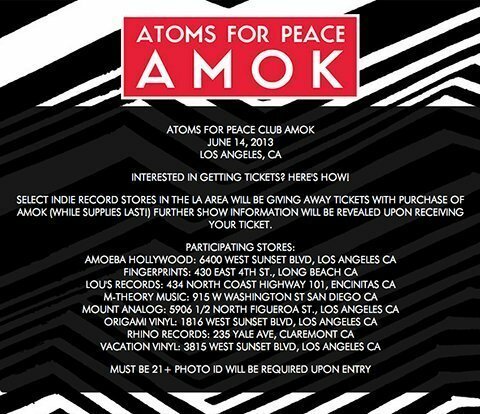 SELECT INDIE RECORD STORES IN THE LA AREA WILL BE GIVING AWAY TICKETS WITH PURCHASE OF AMOK (WHILE SUPPLIES LAST!) FURTHER SHOW INFORMATION WILL BE REVEALED UPON RECEIVING YOUR TICKET.